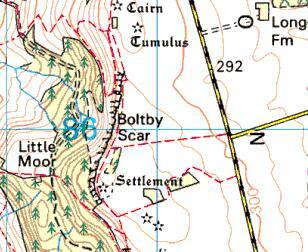 1850's OS map entry and the modern OS map for the area (right). "Willmot's excavation of Boltby Fort yielded a large flat rimmed coarse sherd which Challis and Harding suggest can be dated to the first half of the first millenium B.C., by comparison with a similar sherd from Mam Tor, Derbyshire" The Cleave Dyke System. Spratt, D. York. Arch. 54 1982. This fort should be viewed in conjunction to any relationship between it, Roulston Scar and the Cleave Dyke system. 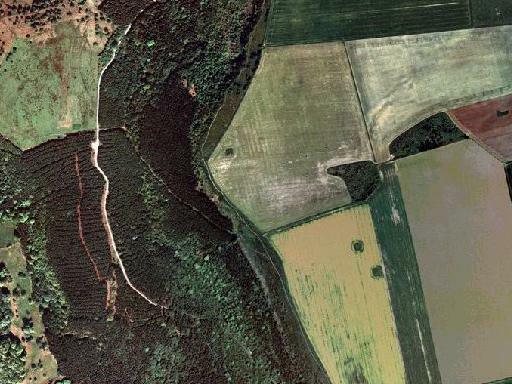 Rows of filled in pits leading to two of the barrows shown by aerial photography indicate an earlier works was destroyed to create parts of the ditch system. See the report - Further Information on the Cleave Dyke System by D. Spratt - Yorks. Arch. 58 1986. "The construction of the ramparts of the small fort at Boltby Scar, east of Thirsk (Plan; Elgee 1930, fig. 54), is not certain. G. F. Willmot, who excavated the site in the late 1930's, considered (in correspondence) that the rampart, 3 ft high, was formed of a simple rubble upcast from its outer ditch. 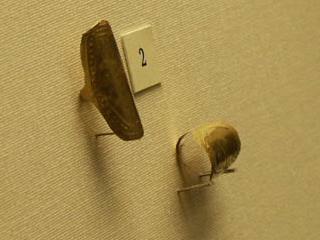 The pair of gold basket-shaped ear-pendants found on the turf line beneath the rampart he considered to be a votive offering placed when the structure was erected. Ear-rings of this distinctive type have been found elsewhere in Britain, notably at Bradley in Berkshire (Inv. Arch. G.B. 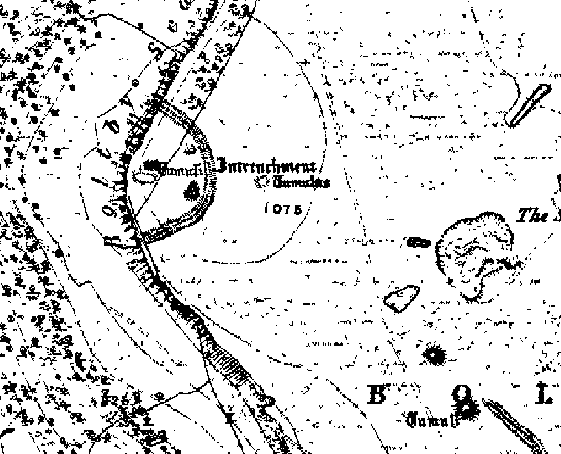 2) and at Kirkhaugh (see pic), Northumberland (Tait 1965, 31A) in bell-beaker graves, and elsewhere in contexts that would satisfy an early Bronze Age date. More recently however, Marien has argued that (1970) for a late bronze age date (Hallstatt A) for the basket shaped ear-rings from Sinsin, Namur (Bequet, 1883, 234 and Pl. I, fig. X; Marien, 1952, fig. 173), basing his case not only upon the stylistic affinities of the Belgian examples and their related finds but also on metallurgical analyses which point to a late Bronze Age date for the group. If we are thus obliged to admit a longer time-range for the type, it could indeed be that the Boltby Scar ornaments are contemporary with the construction of the earwork. The ramparts enclose the sites of at least two barrows. After a large part of the fort was bulldozed by the farmer in 1961, a great deal of neolithic pottery from the surface by Mt T. Lord of Settle. However, fragments of a course, bucket-shaped pot (Fig. 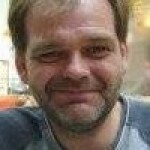 1, 3), and the situation and character of the promontory fort suggest an early first millennium date." Later Prehistory from the Trent to the Tyne, Challis and Harding, BAR 20, 1975. 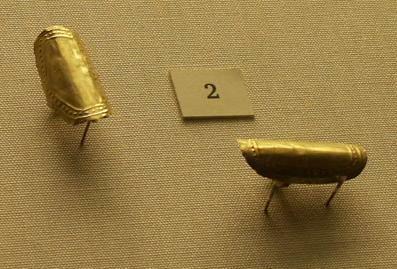 Pair of gold basket ornaments, found at Boltby Scar, North Yorkshire, Copper Age/Early Bronze Age, 2500-2000 BC now in British Museum. "The objects were probably hair ornaments"
"SE507869 W. A. Mackay found a leaf shaped flint arrowhead, flakes and a core during fieldwalking in 1974." YAJ Vol 50, 1978, p.7. "A semicircular area of 2.5 acres has been cut off by a bank and ditch on the E side. A steep hillside protects the W. An original entrance has not yet been identified. There are three barrows within the earthwork. One covered a primary burial in a collared use c. 1700-1400 B.C. The camp may have been built c. 500-100BC." Guide to prehistoric England, Nicholas Thomas 1960.